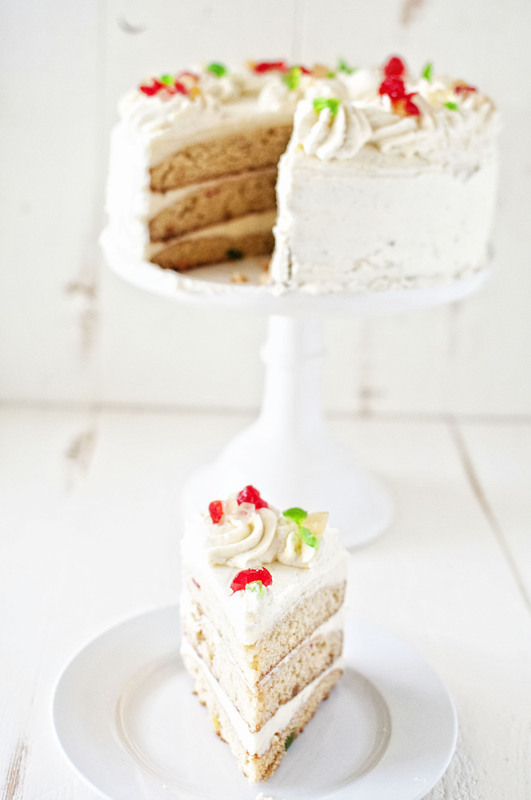 Fruitcake Layer Cake: Layers of bourbon cake studded with candied fruit, brushed with more bourbon, and slathered in vanilla bean Swiss Meringue Buttercream. I think fruitcake gets a bad rap that it doesn’t deserve. I avoided it for years just because of how much it was made fun of. First of all, yes, it is heavy. Most fruitcake is dense and studded with candied fruit and nuts. Which weighs it down. Then you soak it in booze and it gets even heavier. But all of that is good stuff. I’ll admit that store bought or the kind shipped from catalogs aren’t all that great. But a good homemade one can be great. I wanted to have some of the flavors of fruitcake but in a lighter version. 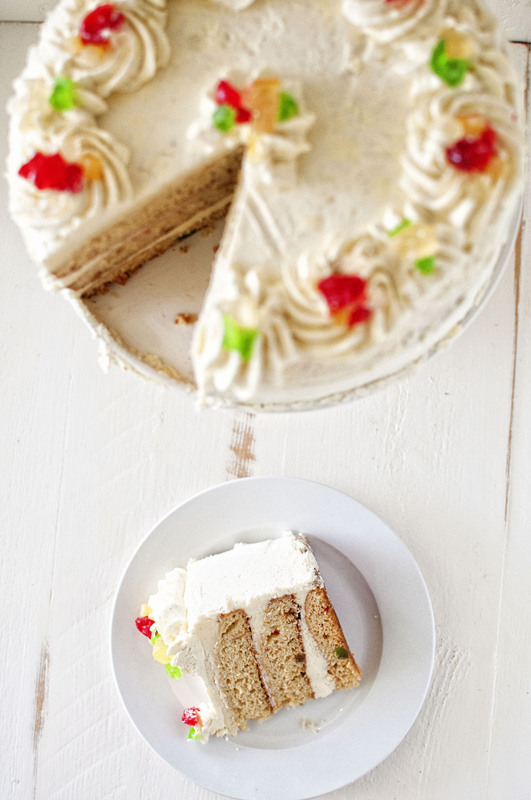 A layer of bourbon cake with fruitcake pieces in it. Brushed with bourbon while still warm. Then generous amounts of vanilla bean Swiss buttercream. You can add nuts to this cake as most fruitcakes have nuts I just wasn’t in the mood for them when I made this cake. If you don’t want to buy all the candied fruit separate they do make just fruitcake mixed fruit that can work just as well. 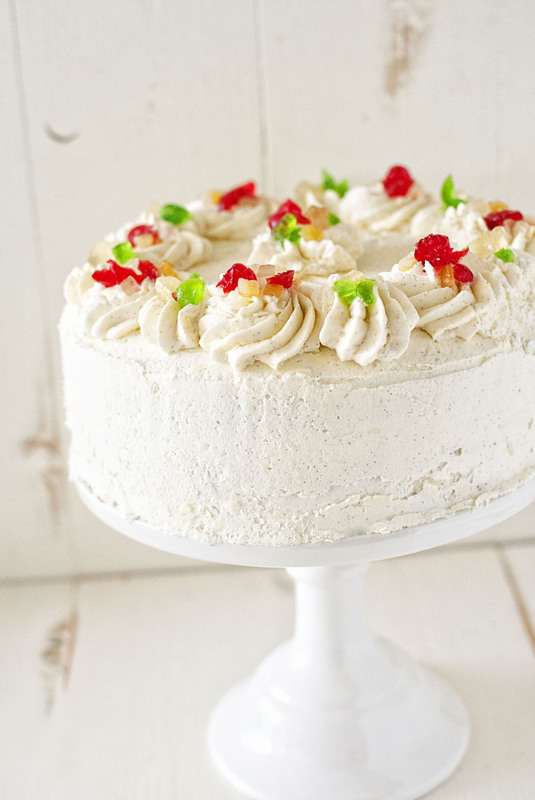 This is a pretty cake and fantastic for having at holiday parties. Grease three 9-inch round cake pans and line the bottoms with parchment paper. In the bowl of a stand mixer fitted with a paddle attachment, beat butter and sugars on high speed until pale and creamy, about 3-4 minutes. Scrape down the bowl as needed. Add the vanilla and then the eggs and yolks one at a time, mixing after each. In a separate bowl, combine the cake flour, baking powder, baking soda, and salt. Add to the mixer in 3 additions, alternating with the buttermilk, scraping down the bowl as needed. Fold in the candied fruit pieces. Mix until fully combined. Divide the batter evenly between the prepared cake pans and bake until edges are golden, and the tops bounce back when gently pressed, 22-25 minutes. Let cool in the pans for 15 minutes, then carefully transfer to a wire rack. Brush each layer with 1 TBSP bourbon whiskey while still warm. Wrap in plastic and chill in the fridge until ready to assemble the cake. Add vanilla extract, vanilla beans, and salt and beat on high for 1-2 minutes until smooth and creamy. Cover with 1/2 cup buttercream. Pipe some decorative swirls on top of cake and top with extra chopped candied fruit (optional).